As children, my siblings and I would usually spend the whole day out playing with our neighbors during weekends and the entire summer vacation. Playtime with them is one of the fondest memories I have and I can still remember the names of our playmates because of these happy moments. I believe that playing with my siblings and neighbors taught me important life lessons - teamwork, sharing, and how to respect other peoples' feelings to name a few. Did you also have the same experience as a child? 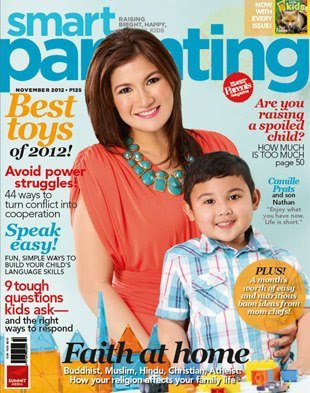 Smart Parenting magazine recognizes the importance of play in children in their November issue. And because kids nowadays don't get the luxury to play outside with friends that much, Smart Parenting again released their annual list of the best toys. From interactive toys to the newest knickknacks and gadgets, be amazed by the toys that made it to the list of "The Best Toys of 2012". "No More Power Struggles" - Gives you 44 ways on how to turn conflict to cooperation. "Spoiled Rotten" - Learn how you can avoid spoiling your children or do damage control if they already are. "Kid's Toughest Questions" - Know how to answer smartly to satisfy your kids' curiosity. "Faith at Home" - Discover how to raise morally upright kids from 5 women of different faiths. This November issue is still available in newsstands, bookstores, and supermarkets nationwide for only Php 125. A copy of the National Geographic Little Kids zine is still bundled for free with ever copy of Smart Parenting magazine so grab your copy now! I should get a copy of this month's Smart Parenting magazine to know what gift to give my son this Christmas. I've been meaning to buy this magazine for so long. In the few issues I bought I find it very informative. I'd definitely get a subscription next year and buy this particular issue when I get out of the house. I never had a copy of this magazine. I got the chance to read it once in a salon. Their articles are very interesting and helpful for us mommies. Ganda pa rin ni Camille. Laki na pala ng anak nila.